This Grilled Cheese Sandwich is my adaptation of my favorite appetizer, Blue Cheese Stuffed Dates Wrapped in Cherrywood Smoked Bacon. By substituting the blue cheese with Horizon Organic Cheddar Cheese you’ll find cheese that melts beautifully, with a sharpness that mates well with the sweetness of the figs and the smoky bacon. This is also a perfect appetizer. After cooking cut into bite-sized strips and serve. 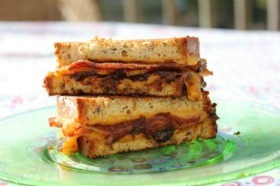 Inspired by my favorite appetizer, Cheese Stuffed Dates Wrapped in Cherrywood Smoked Bacon, this combination takes the grilled cheese sandwich to the next level. Equally spread the Fig Butter equally on each slice of bread. In a large skillet, heat the butter over medium heat. Once the butter is melted, place a slice of bread Fig Butter side up in the skillet. Top with a slice of cheese. Next top with the cooked Cherrywood Smoked Bacon (halved) and then the second slice of cheese. Place the second slice of bread Fig Butter side down on sandwich. This entry was posted on Monday, April 30th, 2012 at 2:24 pm	and is filed under Recipes. You can follow any responses to this entry through the RSS 2.0 feed. You can leave a response, or trackback from your own site.